Jennifer Lawrence has already scored a Golden Globe at tonight's ceremony. In fact, she was the first. While she was on stage accepting her award, the internet was hard at work spreading the good word about that gorgeous Golden Globe dress. Not surprisingly, Miss Lawrence stepped out in a number from Dior. While most of us were talking about how absolutely amazing she looked, others were talking about how her ensemble closely resembled a dress once worn by Ariel in Disney's The Little Mermaid. Wasn't that a ship sail and some rope? Come on guys, that's just wrong. 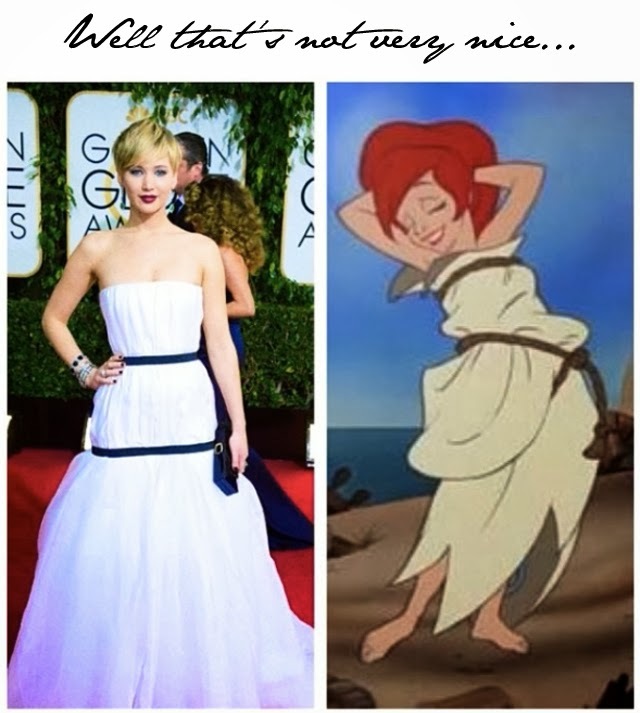 Comparing Dior to Disney. That's fashion prison for you, immediately.